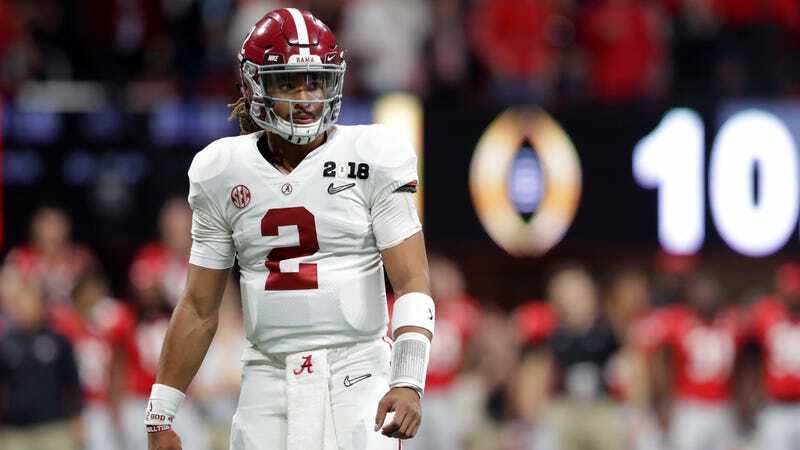 Alabama quarterback Jalen Hurts is 26-2 as a starter, the reigning MVP of the Sugar Bowl, and the 2016 SEC Offensive Player of the Year. And according to his dad, he’ll be the “biggest free agent in college football history” if he’s not starting come this August. In the national title game against Georgia last January, Hurts was replaced after a rough opening half by Alabama freshman Tua Tagovailoa, who’d only seen the field in garbage time up to that point. Tagovailoa led the Crimson Tide to an overtime national championship victory, sealing it himself with a beauty of a 41-yard strike. In becoming a folk hero (as much as a quarterback for the best program of the decade can be a folk hero), Tagovailoa also opened the door for head coach Nick Saban to initiate a quarterback competition. Last week, Averion Hurts, Jalen’s dad, spoke with Bleacher Report for a feature on this very subject. The piece is full of anonymous quotes from NFL scouts and other SEC coaches praising Tagovailoa (likely hoping they can scoop up Hurts). The most important soundbites, though, come from the elder Hurts, who was at first quick to accept Saban’s position—“I told Jalen, you fucked up, you opened the door and put yourself in this situation,”—but made clear that his son won’t be a benchwarmer. After the game, Saban stuck up for his quarterback, saying the offensive line let a few too many Alabama defenders in the backfield for him to establish any sort of rhythm, hinting that Hurts has a tendency to jet off instead of look downfield when the pocket collapses. Meanwhile, Mac Jones, the third-stringer being referenced in the above video, shared in the Spring Game MVP honors—the Jacksonville native was 23-of-35 for 289 yards, two touchdowns, and one pick. As of now, it doesn’t seem as though Jones will leapfrog Tagovailoa or Hurts, but it also didn’t seem like Hurts would’ve ever been benched at halftime of the national title game.